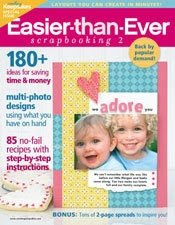 Idea Book: Easier-Than-Ever Scrapbooking 2 + a giveaway! Overall I would call myself a “simple scrapper”. I do like to venture out of my simple box on occasion, but for the most part a simple and easy approach really appeals to me. This is part of why I love this special issue by Creating Keepsakes. The layout designs are beautiful and easy to replicate. It is filled with pages that can be scraplifted in 30 minutes or less. 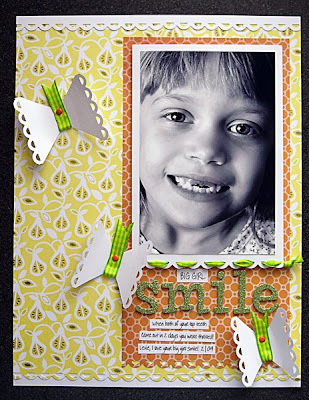 And if you like to create multiphoto pages with space for journaling, you’ll love Easier-Than-Ever Scrapbooking 2. Let me share with you the format of this special issue. It’s genius! It starts off by listing “stock items” that every scrapbooker’s "pantry" ought to have. For example: cardstock, patterned paper, a computer, letter stickers, ribbon/trims, brads, pens, stamps, etc. The first section includes pages made by using “pantry only” items—things that most scrapbookers would already have in their stash. The next section displays pages made using “the pantry + 1”—in other words using just the basics plus one special item you may not have on hand. The third section showcases pages made by using “the pantry + 2 or 3”. These pages include 2 or 3 extra items adding a little more pizzaz. Each section also includes time needed plus instructions on how to create the pages, bonus projects made with leftover product, suggestions to simplify elements on some pages, and how-to’s on cool techniques used. 1) The only thing I might have liked to see in addition to what was already included would be sketches of the pages. *This layout was made using only “pantry” items I had on hand in my stash. *This was layout made using “pantry + 1”. 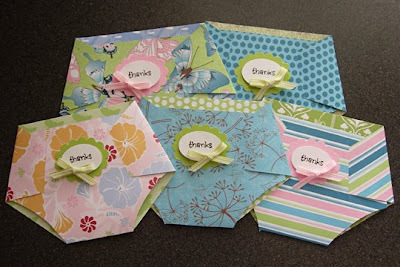 *These baby thank you cards were made using “pantry + 2”. What do YOU think + a giveaway! Have you read this idea book? If so what do you think? If not, does it seem appealing to you? Well, if it does, then you’re in luck! We’ve got 2 free copies to give away, so leave a comment before Thursday 12:00 NOON EST and your name will be entered in the drawing. I am also morning the loss of Simple Scrapbooks so I would love to get this idea book in the mail one day!! I haven't read this but I think it would give lots of great inspiration. I havent read these...but would love to have 1 in my hands..the idea of using "pantry" items is intriguing..but yes i would have too appreciated if they would have had sketches of their layouts !! it would have made scraplifting much easier !! I peeked through this book at the bookstore and would love to have it! It's a great concept. How did you make the baby cards? They are precious! I have not seen this idea book yet but it sounds great. I've been scrapping for years but even I love a good step by step once in awhile. Also I love the idea of a scrapbooking pantry. Most of us have tons of stuff but do we have what we need to create? I bet this book will help with that. I love to scrap but I can never use the word Easy & Scrap in the same sentence. Fun yes but not easy. Would love to take a peak at this. Loved (and now miss!) Simple, so a simple approach sounds great. I'm a simple scrapper too, so this looks like the perfect book for me! I really like to focus on the pictures and story and am always looking for new ways to do that. Have been trying to "shop my stash" lately and simplify my scrapping so I spend less time (as well as money) on planning and more time playing and creating. Would LOVE to be a lucky winner of this great book to help me do both! I have been really interested in this idea book! Saw it once, browsed, didn't buy---wish I had! Now I'm keeping my eye out for it again. Love the concept and the way this book is put together! I have NEVER heard of this book before but I would TOTALLY be interested because I would LOVE to be able to make simple but gorgeous scrapbook layouts!! I have not read this book. But I love getting my inspiration from books and yes....it does apeal to me. Hope I win! I would like a copy of this book! I have the first volume and have used it A LOT. I think I have seen (o nthe shelf) this one, but did not pick it up to look through. However, from your review and samples, I think I just might have to have another look! Maybe need to get back to 'basics' to more forward! This looks like a great book with really useable ideas! I love the butterfly page above!!! I haven't read this book, but it sounds wonderful. I'm SOO behind in scraping it's not even funny. Thanks for the chance to win and get "caught up". The idea of sketches is right on the money. 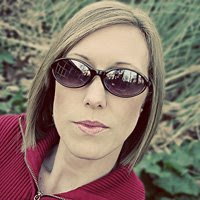 I am a big 'lifter' and love to get dimensions of photos so I can use as a starting point. Thanks! I have NOT read this, but it may be just what I need to get out of my funk!! It's been way too long since I've actually scrapped and I LOVE the idea of using my stash to produce some LOs! I would love to win a copy of this book. I haven't seen it yet. I haven't seen or purchased this idea book, but it souds like one that would suit my style of scrapbooking. This mag looks great. Thanks for the review. I haven't read this one yet... I just might have to run out and see if I can find it! i too am a simple scrapper.. i would love to get a copy! I love these books - they have a lot of great ideas in them. I have the first edition. That's my type of scrapbooking too! I would love to have this idea book because I produce more layouts when I have samples to go by! I really like the sounds of this magazine! Thanks for the opportunity to win it! This sounds like a great resource! I'd love to win a copy! This magazine sounds amazing! I ALWAYS get inspiration from different magazines. Esp if it's easy and quick! Very cool - I've flipped through this issue at Joanns several times but just haven't bought it! I would LOVE to win this! I ahve the first one, and haven't picked this one up yet!! I've not read it, but if I can make great layouts like yours I want it! i have this book and have to say i like it very very much. i sat down one night and scraplifted two of the LOs and loved they were so quick and easy. i will say, though, that since the majority of the LOs have typewritten journaling, i don't really believe they can be completed in the times given. unless you have it all typed, where all you need to do is format it, that journaling will take forever. anyway, just MHO and i do love the book for the great, easy LOs it showcases. Sounds highly appealing -- the word easy jumps sky high today. How cool! I am also simple, but like to go outside the box with altered things. I love the thanks cards. How cute! I would love to have a copy of this. 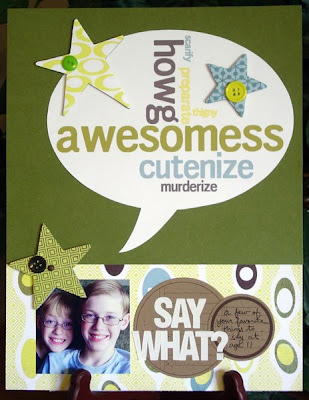 I soooooooo miss Simple Scrapbooks! This looks absolutely great. I just love to read and scraplift! I love simple ideas! I hope I win!! Sounds like a great book - I love the idea of the "pantry" items. I am a newby when it comes to scrapbooking. This looks great, and I'd love to have a copy. I haven't seen the magazine yet, but would love to read one. The diaper thank you notes were super cute. Would love to get one of these. It looks like it has some simple layouts and steps. Sounds like a great issue! Would love a copy. I havent read this, but would love to. The easier the better! I am a total scraplifter so this really appeals to me. Great layouts Aly! I'd love to get my hands on a copy of that book!! This book sounds like just what I need right now. The book sounds great although I hadn't heard of it before. I've always been more of a rubber stamper than a scrapbooker so the idea of an idea book with simple and easy-to-follow ideas and projects is very appealing. Thanks! I have not seen this magazine yet but looks very interesting. I love your first page, the butterflies are awesome. Love the diaper cards as well. I've been interested in this publication since it came out. While I love the look of many different kinds of layouts, I seem to lean toward clean and simple most. I have not seen this issue, but it looks like a great one to get. I love scrapbooking books so this is now on my wish list for purchasing. Thanks for the review!! I Nhave limited windows of time when I can scrap, so the tips here sound like they could really help me get those pages done! Thanks for the chance to win. I might have to look at this again. So many of the books either show such compicated designs or don't break things down like this does! Would love to have a chance to have it! I've just realized that I am more a simple scrapbooker so it would be wonderful to get a copy of this book. Multiphoto layouts are also the best since I have so many photos to scrap. I love the "simple" idea, as well as using things from my overstocked "pantry." Thanks for the chance to win. I haven't read this but I am all about simple! This seems perfect for me! Thanks for the chance. Looks great! I really like the CK magazines. This book likes like one I would really use. The sample pages are very appealing to me. I would love to have a copy. I miss Simple Scrapbooks too. I am definitely a simple scrapper, but I am not very good at keeping my supplies simple...this book looks like it has some good tips on just that! I have not read this idea book, but sure would like to!! I like the idea of using what is in your "pantry" and then adding one more thing and then two more things. It's always fun to see how adding just a simple embellishment can change a layout. Would love something to give me some inspiration - keeping everything crossed. Thank you. Great projects! I think it looks like it has a lot of fun ideas and inspiration. Thanks for the chance! haven't read the book but looks great!! Looks cool! I love the pages you made. This book looks great and I would love to have one to study. Lots of great ideas for using what you have on hand. I like that. This looks great! I'd love to spend an hour or two devouring this! Thanks for the chance to win! I have not read this, but looks like something I would LOVE! I too am still in mourning from the loss of Simple Scrapbooks so this looks like a great read. Thanks for the chance to win! Sounds interesting. I would be interested in this book. Thanks. I haven't read this, yet, but I absolutely love idea books. They are a great kick-start for me when I'm having a creative block. Thanks for the chance to win! I would love love love a chance to check this out! What a cool giveaway. Count me in! What a cool mag! I would love to check it out. I too consider myself to be a "simple scrap booker". Although I have not read this book yet, I am now on the lookout for it. Simple layouts can become redundant and sometimes I fall into a rut. I rely on books like this one to keep my projects fresh. I loved the first edition of this book and was so excited to see a second edition! Thanks! This book looks great...the fact that pages can be made quickly and mostly from one's stash make it doubly awesome! Cute baby thank you cards! I would LOVE to have this Book to read and work with. This looks wonderful. I love your inspired layouts. I'd love to win! Sounds like a book that I could use. I enjoyed reading your review and seeing your layouts. I have had my eye on this book for a long time. It really appeals to me for the easy-to-emulate layouts. There's times I want to be artsy and times I just want to be simple...this is for the latter. Thanks for the giveaway! I am missing Simple Scrapbooks terribly - it was my staple, my one true love for many years! This idea book however, sounds like it's right up my alley - multi-photo with room for journaling (I'm big on journaling), simple pages and minimal product - my middle name is "simple" (um that didn't sound right did it!!). I would seriously love a peek at this book to satisfy the hole left by SS. Looks like a great publication. Since I have a ton of product, I like the idea of using items from the "pantry". Even more than saving money, I'd love to save some time and get more layouts done. Thanks for offering the giveaway.